DAVIS, California, October 9, 2015 (ENS) – Roughly one in every four fish sold for human consumption in certain California and Indonesian markets contain plastic fragments or textile fibers in their guts, an international team of scientists has found. Published in the journal “Scientific Reports,” the study is one of the first to directly link plastic debris with the fish that shows up on dinner tables. Researchers from the University of California, Davis, and Hasanuddin University in Indonesia sampled 76 fish from markets in Makassar, Indonesia, and 64 from Half Moon Bay and Princeton in California. The researchers collected whole fish, GI tracts of fish and whole bivalves directly from fish markets or from fisherman selling their catch for human consumption. Not all fish tested had plastic in their guts. Species tested included tilapia, skipjack tuna, salmon, herring, mackerel, scad and snapper. Plastic debris or fiber was found in the guts of Indian mackerel, shortfin scad, silver-stripe round herring, two species of rabbitfish, and fish from the family Carangidae that could not be identified as to genera. 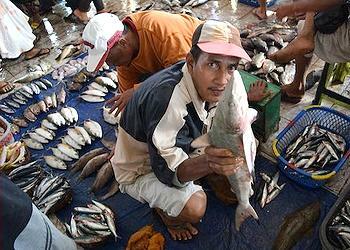 In Indonesia, manufactured debris was found in 28 percent of individual fish and in 55 percent of all species. Similarly, in the United States, anthropogenic debris was found in 25 percent of individual fish and in 67 percent of all species. Manufactured debris was also found in 33 percent of individual shellfish sampled. 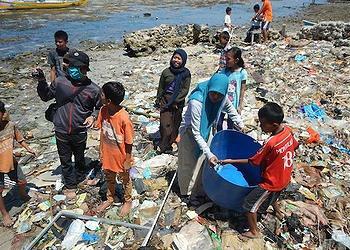 All of the fragments recovered from fish in Indonesia were plastic. In contrast, 80 percent of the debris found in California fish was fibers, but not a single strand of fiber was found in the Indonesian fish tested. “It’s interesting that there isn’t a big difference in the amount of debris in the fish from each location, but in the type – plastic or fiber,” said lead author Chelsea Rochman, a postdoctoral fellow in the Aquatic Health Program at the UC Davis School of Veterinary Medicine. “We think the type of debris in the fish is driven by differences in local waste management,” said Rochman. Indonesia has few landfills and little waste collection or recycling. Instead, large amounts of plastic are tossed directly onto the beaches and into the ocean. A lack of purified drinking water that forces Indonesian residents to drink bottled water, and they often toss the plastic bottles. Meanwhile, the United States has advanced systems for collecting and recycling plastics. But most Californians wash their clothes in washing machines, the water from which empties into more than 200 wastewater treatment plants off the California coast. The authors theorize that fibers remaining in sewage effluent from washing machines were ingested by the fish they sampled in the state. “To mitigate the issue in each location, it helps to think about local sources and differences in waste management strategies,” Rochman said. The scientists emphasize that the plastic and fibers are found in the fishes’ guts so humans are likely to eat the debris only if the fish is eaten whole, as it is in Indonesia, or as with sardines and anchovies or shellfish such as clams or mussels. Human food security could be impacted if the plastics damage or destroy whole populations of fish, they warn. The study was funded by a UC Davis Outreach and International Program SEED Grant, the National Science Foundation’s Graduate K-12 and IGERT programs, and the National Institute of Environmental Health Sciences’ Superfund Research Program.